A historically heavy voter turnout highlighted Election Day throughout Putnam County Tuesday where state, county, town and villages races were decided. More than 37,000 ballots were cast or nearly 60 percent of those registered balloted at the county’s 86 polling places. Another 3,000 absentee ballots were issued with 2,262 to be counted November 13. The race that generated the most interest locally was for county executive where Executive MaryEllen Odell defeated Kent Supervisor Maureen Fleming by a tally of 20,293 to 15,718. The Villa Barone in Mahopac was the scene of a Republican celebration where 200 members of the GOP gathered. County Clerk Michael Bartolotti had a free ride this year in his reelection bid as did Coroner Dr. Michael Nesheiwat. John Bourges also sought a coroner’s post running unopposed. Three seats were decided on the Putnam Legislature. Barbara Scuccimarra of Garrison lost her bid for reelection to Nancy Montgomery. The tally was 2,992 to 2,159. Joseph Castellano of Southeast was reelected, besting his opponent Scott Reing by a tally of 2,041 to 1,556 and Legislator Ginny Nacerino of Patterson ran unopposed. In the Town of Kent, Democrat Gary Link was defeated by Republican Chris Ruthven to fill an unexpired term on the Kent Town Board. The tally announced at Board of Elections headquarters was Ruthven 2,653 to Link 2,151. In Patterson, Anthony Mole faced no opposition for Town Justice and in Southeast, Melinda Montanaro, the Democrat, was defeated by Eric Larca to fill an unexpired term. The tally announced was Larca 3,590 to Montanaro 2,845. In Brewster, Tom Boissonnault and Mary Bryde were reelected to the Village Board running unopposed while in Cold Spring Lynn Miller and Steve Voloto, also faced no opposition for trustee seats. While Governor Andrew Cuomo was reelected statewide by a huge margin, his challenger, Dutchess County Executive Marc Molinaro was victorious across Putnam by a vote of 19,838 to 15,257. A laundry list of candidates sought seven seats on the State Supreme Court representing the 9th Judicial District. Putnam County Judge James Reitz led the list of Republican candidates garnering the most votes across the county, 20,453, but fell short in his bid to win a seat on the high court. Both of Putnam’s state senators faced reelection Tuesday. Senator Terrence Murphy was defeated by Peter Harckham while State Senator Sue Serino eked out a narrow victory over Karen Smythe. Harckham lost to Murphy in Putnam by a tally of 14,171 to 8,111 but his Westchester supporters overwhelmingly endorsed the candidate. District wide, Harckham tallied 51,229 votes to Murphy’s 47,714. Serino defeated Smythe in Putnam by a tally of 7,081 to 6,758 and district wide leads by 2,100 votes with some 10,000 absentee ballots to be counted in both Putnam and Dutchess. Two members of the State Assembly representing constituents in Putnam also faced reelection. Kevin Byrne defeated Vedat Gashi while Assemblywoman Sandy Galef was victorious over Lawrence Chiulli. In Putnam, Byrne tallied 15,908 to Gashi’s 10,170 and Galef’s numbers in Putnam were 5,342 to her opponent’s 3,838. In the 18th Congressional District, Putnam’s favorite son, Representative Sean Patrick Maloney of Cold Spring, faced off against James O’Donnell. 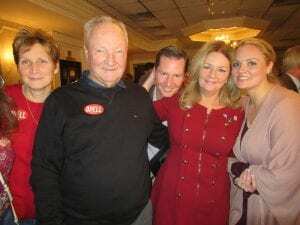 While O’Donnell was the victor in Putnam by a tally of 18,538 to 17,380, the incumbent was the winner district wide that encompasses all of Orange County and sections of Dutchess and Westchester in addition to all of Putnam. The overall tally: Maloney–130,420 to O’Donnell–106,381. Terry Gipson represented Putnam for 2 years after his election to the State Senate in 2012, so the statement that Pete Harckham’s election represents “the first time a Democrat will represent Putnam in the State Senate in decades” is inaccurate.